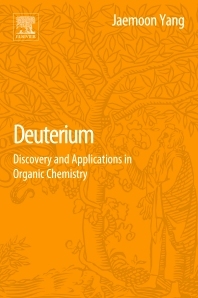 Deuterium: Discovery and Applications in Organic Chemistry provides a well-illustrated overview of the discovery of 2H or heavy hydrogen, the stable hydrogen isotope with both a proton and a neutron in its nucleus. The work introduces the isotope, its discovery, physical properties, nomenclature, and common compounds, also exploring its application in organic chemistry through classic and recent examples from literature. Finally, the book devotes one chapter to Deuterium in medicinal chemistry and the biological effects of Deuterium Oxide, better known as D2O. Jaemoon Yang is Senior Chemist II at Cambridge Isotope Laboratories, Inc. in Andover, Massachusetts. He received his Ph.D. degree in organic chemistry in 2000 from the University of Pittsburgh under the supervision of Professor Craig Wilcox. He carried out his postdoctoral work with Professor Marisa Kozlowski at the University of Pennsylvania. He joined CIL in 2007 where he is actively involved in the synthesis of deuterium-labeled compounds and the development of better methods for efficient H/D exchange reactions. He has more than 10 publications in peer-reviewed journals from the graduate and postdoctoral research. He is the author of “Six-Membered Transition States in Organic Synthesis” published in 2008. This is a thorough monograph on deuterium. I really liked it and it gave me the necessary background on this intriguing isotope.